This charming, strong growing variety of Clematis keeps hold of its dark green, cut-like leaves until November and is very easy to grow. Clematis 'Anita' has small, dainty, semi-nodding white flowers with intense yellow centres, which are freely produced from mid summer to autumn. This non-evergreen climber will scramble wonderfully up fences, trellis, natural supports like trees or bushes and can also be used as a covering plant to hide an unsightly building or wall. 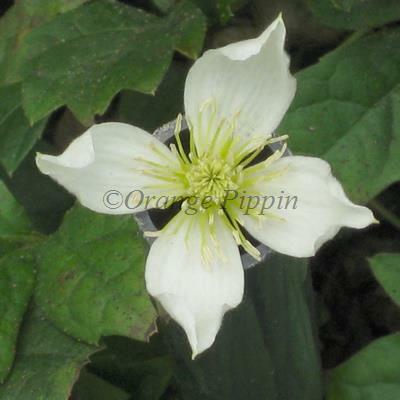 Clematis 'Anita' was raised by Rinus Zwijnenburg of Boskoop, Holland. 'Anita' can be grown in any aspect, but does best in full sun. It prefers soils with good drainage, and it is best to avoid situations where standing water over winter is a possibility. With regard to climate, 'Anita' is both very cold-hardy and will also tolerate hot summer temperatures.